In high school, my favourite class was art class. Mr. Gombai was an artist, and judged our works perhaps a bit harshly. If you got a 90, you knew darned well you deserved it, good grades were not handed out easily. Sometimes, one of our fellow students would sit on top of the counter at the front of the class and the rest of the class would work on copying that image with pencil into our sketchpads. I do remember mine looked a bit distorted, and I learned I could NOT sit and draw with my pad flat on my desk. One model was tall to begin with, by the time I finished my drawing, he looked even taller and thinner. One assignment was to paint a vase. This was not an ordinary vase. 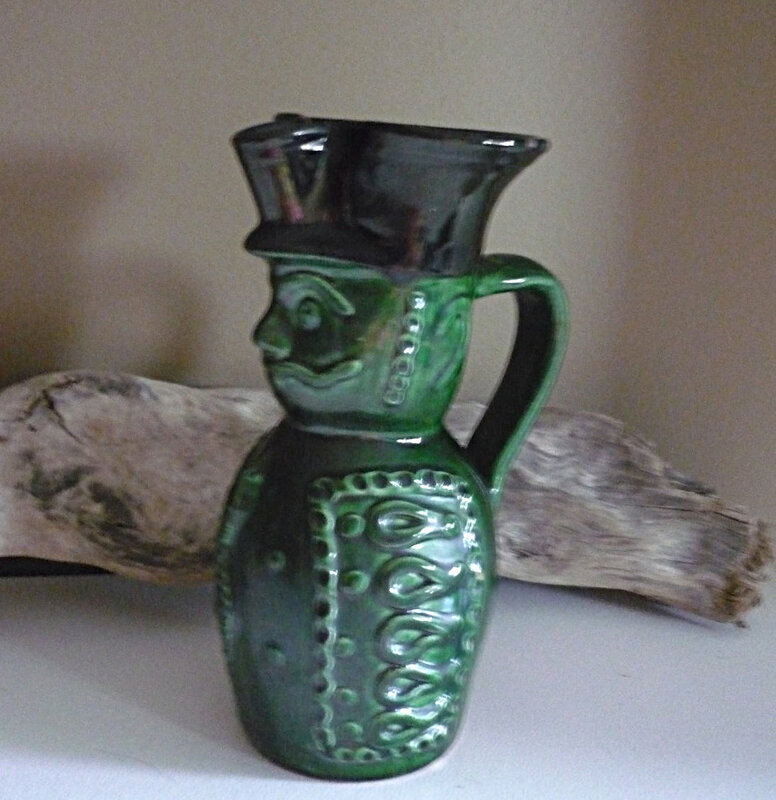 It was a mottled green vase with a black 'rim' around the top, and was slightly figural. We teased the teacher about it, and he told us the vase was one he had smuggled out with him when he left Hungary. To this day, I am not sure if the story is true, or one he made up just to put us in our place. Hungarian vase, photo is property of bellaroni on Etsy and is used here with permission. This vase has been sold and is not available for purchase, but bellaroni does have other vintage items to check out! Sometimes, my brother and I will reminisce about art class and Mr. Gombai, and usually, the topic of that ugly vase comes up. Looking back, it wasn't really so ugly; perhaps the years have added beauty to it in the memories that it brings forth.